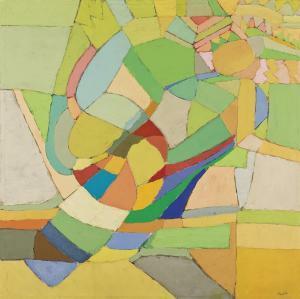 Find artworks, auction results, sale prices and pictures of Amine El Bacha at auctions worldwide. Amin El Bacha (Lebanese, 1932-2019) Untitled signed and dated \‘Elbacha 63\’ (lower right); signed and dated \‘amine el Bacha 1963\’ (on the reverse) oil on canvas 34 2/3 x 28 1/3 in. 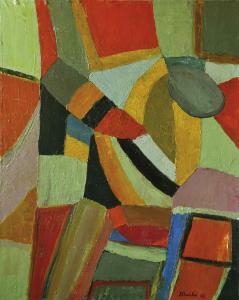 (88 x 72cm.) 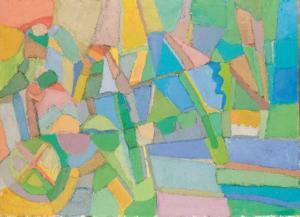 Painted in 1963 Provenance Acquired directly from the artist by the present owner\’s grandfather, thence by descent. 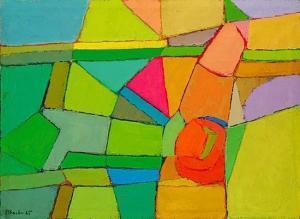 Amine El-Bacha is a spontaneous and compulsive painter. He paints not only on canvas but on woodern sculptures, wooden screens, and on furniture. This is an exceptional early example of the latter. El-Bacha has taken an ordinary wooden door and has transformed it into something whimsical, exotic and romantic.